This season of MotoGP is turning out to be quite special. One might think what’s so special about it when the winner has been the same in all 7 races so far. But if you are someone who is a fan and follower of the sport for many years, you’ll know what I mean. For one, Marc Marquez is consistently breaking records and creating new ones. Last year, he became the first rider to become the world champion in his first year in MotoGP as well as the youngest one to do so. He is defending his world title in supreme style and yesterday not only did he win the race but also became the 2nd rider in the history of the sport to win 7 consecutive races. The only rider who has done this before is Valentino Rossi. But the Catalunya race this year was special. For the first time this year, Marc Marquez was not on pole as he crashed out in qualifying at the end of the main straight while trying to better his team mate Dani Pedrosa’s time. As a result, Marquez started the race from 3rd place on the grid on the first row. Dani Pedrosa was on pole (his first pole in a year) and Movistar Yamaha’s Jorge Lorenzo started the race from the 2nd position. Valentine Rossi placed 5th on the starting grid (he finished the last race in Mugello at 3rd starting from 10th on the grid and had remarked that he must improve on his qualifying to have a better fighting chance for the win). Rossi was joined by LCR Honda’s Stefan Bradl and Forward Racing’s Aleix Espargaro at 4th and 6th positions respectively. However, the talking point of the day till the race started remained that Marc Marquez was not on pole. We have witnessed few close races this year and yesterday was the closest of them all. Not 2 but 4 riders slugged it out on the track to the crowd’s delight. The weather remained tricky throughout the afternoon as there were massive dark clouds above along with little bit of sunshine here n there. Thankfully, the weather remained dry. One good outcome from this weather condition was that the track temperature never got too high and this gave a prolonged life to the medium front and rear tyres that the top 4 factory riders used. It specially allowed Rossi to be more aggressive attacking corners and braking. So the 25 laps race started under the shadow of the clouds with Lorenzo leading the pack into turn 1 followed by Pedrosa. Rossi went passed Marquez on the outside to settle into 3rd as the riders negotiated first few turns. 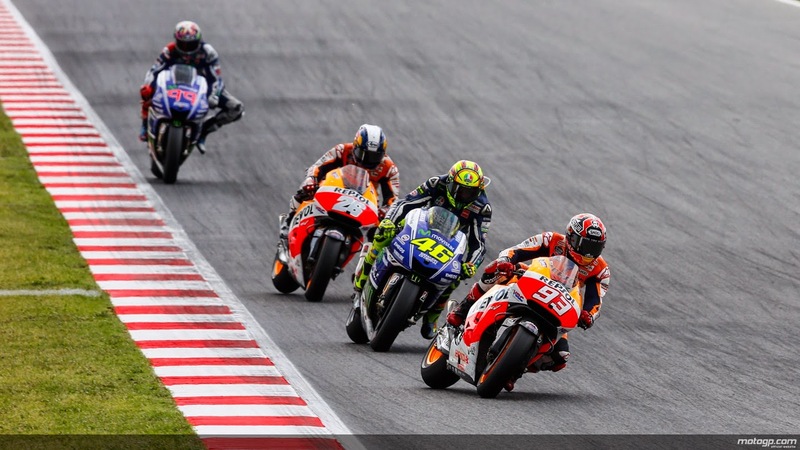 Behind the Italian, it was Marquez on 4th followed by Stefan Bradl in 5th. Rossi attacked Pedrosa on the first lap itself to arrive on 2nd behind his team mate and now Pedrosa was under attack from Marquez. On lap 2, Marquez made his move for the 3rd position and put his team mate out of the podium position. With 3 laps into the race, Rossi and Lorenzo indulged in a short dogfight with Rossi eventually leading the race from then on. Marquez capitalized on this situation and attacked his fellow countryman bearing # 99 and didn’t allow him to settle into 2nd. Lorenzo was eventually bested by Marquez and relegated to the 3rd spot. Soon after, Pedrosa overtook Lorenzo for the 3rd position but Lorenzo kept close. The top 4 riders were still within fighting distance of each other all this time. However, Lorenzo slowly started to lose his grip on the front 3 and was eventually left out of contention for the podium finish. He remained unchallenged at 4th for the remainder of the race though. At the front, Rossi ran a very good pace in 1:42s maintaining his lead but could not open a big gap. In the following laps, Pedrosa made some passes on Marquez only to Marquez respond back almost instantly with some aggressive overtaking manoeuvres while continuously closing the gap to Rossi. As the remaining laps went from 14 to 13, Marquez came close enough to Rossi to take advantage of the slipstream on the main straight. Rossi isn’t an easy man to pass and braked harder than Marquez while keeping his line tight. Marquez had to sit up to avoid a collision and went wide into turn 1. Thankfully, the tarmac is extended in turn 1 so riders who run wide can still keep their bikes up. Marquez re-joined the battle just behind his team mate allowing Rossi to build a small gap from the Repsol Honda pair. Marquez again overtook Pedrosa on the same lap for 2nd and continued to close his gap to Rossi. With 6 laps remaining, Marquez finally made a move on Rossi on turn 1. Pedrosa was close enough and almost instantly made a pass on Rossi making the Italian lose 2 positions in the first 2 turns. However, there was an accident for which the yellow flag was being waved at the same time. Marquez noticed it and immediately raised his hand and Pedrosa did the same. They allowed Rossi to reclaim the lead as they both had passed him during the yellow flag. It was a tricky situation and the teams readied their bikes for the riders as they thought the riders raised hands due to rain. The rain never came eventually and the race went on. Soon enough, Marquez made another move on Rossi into turn 1 but Rossi fought back and reclaimed the lead. The 35 years old Italian and the 21 years old Spaniard indulged in some good dogfighting over the next lap or so. Marquez finally made his move stick for the lead and with 4 laps to go, Rossi was overtaken by Pedrosa for the 2nd spot. From then on, it was a very tight battle for the top podium between the two team mates as they both seemed to carry slightly higher pace than Rossi. Pedrosa really stood up to Marquez in the final laps. In the last lap, the battle was too close and Pedrosa touched the rear of Marquez’s bike just before the final corner and almost took himself and his team mate out. Luckily, none of the riders fell but Pedrosa had to run wide and Marquez was able to keep his line and crossed the finish line in first. Rossi was close enough to take advantage of this situation and finished the race in 2nd while Pedrosa finished in 3rd. Though Marquez won for the 7th time in a row, it was a great race and an important one. He is undoubtedly the best rider at the moment but the rest three – Pedrosa, Lorenzo and Rossi, have put up a great fight against him recently and the challenge for the current world champion has seemingly increased. Marquez is being pushed more and more in the last couple of races at least and in the latest Barcelona round there was more than one rider challenging him till the end. Working with a new crew chief Silvano Galbusera, Valentino Rossi seems to have found some solutions for the problems he faced last year especially related to his bike’s braking. Also, the teams have now been given the option to use bigger 340mm disc brakes should bring improvements as well. He has been faster and closer to the front this year compared to last year and he is 2nd in the championship at the moment. The 9 times world champion is far from showing any signs of giving up and he is consistently taking the fight to the front. Other than the podium finishers, Lorenzo crossed the line in 4th and Stefan Bradl finished in 5th making him the top satellite rider. Marc Marquez leads the championship with 175 points; Rossi is in second with 117 points and Pedrosa in 3rd with 112 points.